Twenty apartments and suites are available for our guests who want to stay in Linz for at least one month. The boarding-house apartments are modern and comfortably furnished and designed in their entire infrastructure for long stays in Linz. Guests can choose from individual service features according to wishes and requirements. The monthly rate depends on the size of the apartment as well as the booked service features. The “Basic Package” includes room cleaning every two weeks with change of bed-linens as well as the monthly rent. Seit 01.01.2019 gilt in OÖ ein neues Tourismusgesetz. 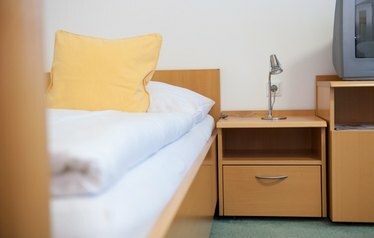 Alle Gäste sind verpflichtet, für die ersten 60 Nächte eine Ortstaxe von € 2,- pro Nacht zu bezahlen. Ausgenommen sind Personen mit einem Hauptwohnsitz in Linz. Der Betrag wird vom Unterkunftgeber eingehoben und an die Behörden weitergeleitet.